I’m glad that I listened to an audio of this novel, as some of the medical terms and jargon that was used, I know that I would’ve had a hard time pronouncing had I read the novel. I enjoyed listening to this novel as Dr. Seward recalls his medical practice and he shares stories about working in the ER. Seward describes some of his most interesting cases that he has had the opportunity to experience in his lifetime. These cases are not always his most successful cases but they’re ones that meant something to him. The novel teaches, the novel shows you what it is like to be on the other side of the table, and the novel shows you the emotions, that are not only one-sided. Great book and a short one also. If you truly want to find out why Stephen King's the greatest Horror fiction writer of all time, then you should definitely read this book. If you truly want to find out more about Stephen King and his childhood and adulthood, then you should definitely read this book. However, if you don't want to read the story of Stephen King's life through the prism of his works in a very descriptive detail, then I'd strongly advise against it, for as rich as this book is with the story of Stephen King's life and his works, it's way too detailed, for it shows to its avid reader way too big of a glimpse inside of Stephen King's character and Stephen King's personality and especially Stephen King's life. Poor Carl! Carl was living a happy, content life until one day a field mouse came upon him and asked Carl a question which he didn’t know the answer to. Carl never knew why he did, what he did but now, the question was out there and he needed an answer. 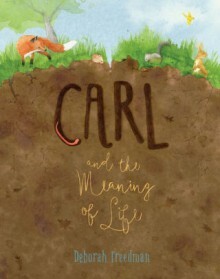 Carl talks to many animals as he makes his journey. Crawling over many miles, Carl’s tone begins to change as his journey is beginning to take forever. Everyone that Carl is talking to seems to know their purpose except for Carl. Finally, when Carl hears the cry of a beetle, he gets the answer to his question. I love how the author put this novel together. It’s not a fact-telling story, it’s a story about helping others and being part of a larger picture. It’s about a community, about being needed and how each individual is important. I liked the simplicity of the illustrations. They were beautiful to look at and I enjoyed watching Carl as he traveled over the fields.